Inspired by our time at Quiltcon we are focusing on different piecing techniques that make amazing blocks. 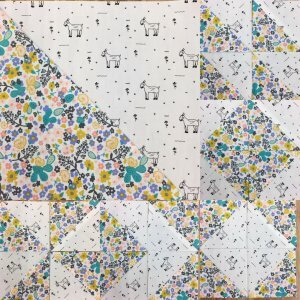 The Kona Designer Block of the Month features foundation paper piecing. Foundation paper piecing is a great technique for precision piecing. Using a paper template, fabric is sewn directly onto the paper, which creates crisp lines and points. 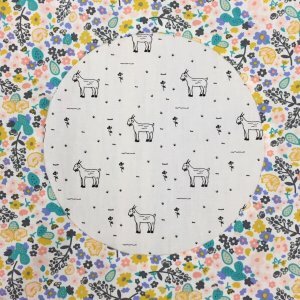 This class includes the Block of the Month (BOM) pattern and fabric. Class is Saturday, March 17 from 11am - 1pm. CIRCLES!!! Do not be afraid. Take this class to learn how to inset a circle using freezer paper and glue. No pins required. Seriously. Saturday, March 17 from 3 - 5pm. This basic block packs a lot of punch when it comes to design. Learn to make the HST and you will find endless ways to combine them into interesting and graphic quilt tops. We love Quilts! Quiltcon, the Modern Quilt Convention, was inspiring on many levels. The amazing variety of quilts on display showcased artistry, color, technique, style, and an array of view points that spoke volumes in the stories they told. Quiltcon provided the opportunity to connect to friends from near and far, take classes, make new friends, and to forge deeper connections to the quilting community. Of course, there was the marketplace to find trouble, I mean, buy fabric, try new tools, and find something special to add to the sewing room. Here at Sew Together we want to share our passion for quilting with you. This month we are focused on different piecing techniques. We offer group and private lessons. New fabric arrives in the shop every week. 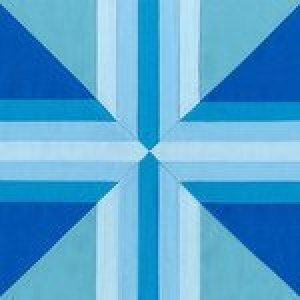 The Los Angeles Modern Quilt Guild (LAMQG) meets here the second Monday of the month. The next meeting is Monday, April 9th at 7:30pm. Come by and visit us and the fabric. Take a class. Check out the next LAMQG meeting. We have an amazing community and we want you to be a part of it.